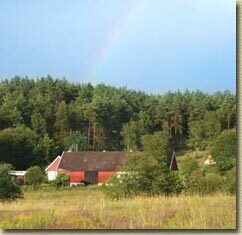 The Sanctuary is an organic Retreat Farm. Due to its location tucked away in a hidden valley in a nature reserve at the edge of a big forest the Sanctuary offers a peaceful and quiet retreat for body mind & soul. An abundance of wild flowers and medicinal plants adorn the meadows and the magical garden of the Sanctuary which embraces a cathedral-like event Dome. The animal kingdom is alive in great variety from Salamander and deer to eagles and cranes. The simple rustic style of the Farm houses with organic Cafe and Healing Rooms remind of a monastery or hermitage. Behind the Farm up on a hill thrones a forgotten ancient stone circle reminding of the inter-connectedness of all life. 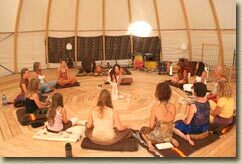 The Sanctuary is a sacred place which invites the visitor to be mindful and practice awareness in action. Located in the Skåne region of South Sweden, this Oasis in a is an ideal retreat for artists, writers, musicians and other creative people due to its undisturbed beauty and inspirational tranquil environment. Only biodegradable organic products are used here to preserve the nature reserve with its pure waters, healthy soil and clean air. The Sanctuary has its own crystal clear delicious water from a well 80 meters deep. At the Sanctuary live beautiful Egyptian temple cats (Abyssinia tortoise mix) which will touch the heart of every child and cat lover due to their very kind and affectionate nature. is the Dormitory and an extra apartment. To the house belongs an organic café and lounge area where organic treats are available during events. In the adjacent building called "Seed House" the Sanctuary Studios are found as recording and rehearsal space for musicians and artists. The Sanctuary Dome - an external dome shaped tent with wooden floor is the Sanctuary Venue for concerts, ceremonies, weddings, workshops and retreats. Here one can find excellent opportunities for yoga, dance and meditation. In the direct surrounding you will find here a lakes, waterfalls, beautiful beaches of the Baltic sea and many wonderful and hiking trails. If you are looking for a place where you can practice introspection and self inquiry or you just want to be inspired for developing your creativity and art, a place that is "balm to your soul", than the Sanctuary is the right address. "Its such a blessing to be at Sanctuary, the place itself is pure healing and the work we do strengthen and raise the healing forces. Now through the years of medicine work the place is just breathing healing medicine, it is in the wind, in every element, you can feel it with every step touching the ground." What is the Vision of the Sanctuary?